In the past few days I had the chance to taste a couple of “weird” asian dishes. Where for “had the chance” I mean: I bought them on purpose, and by “weird” I mean: weird to us italians/westerners. 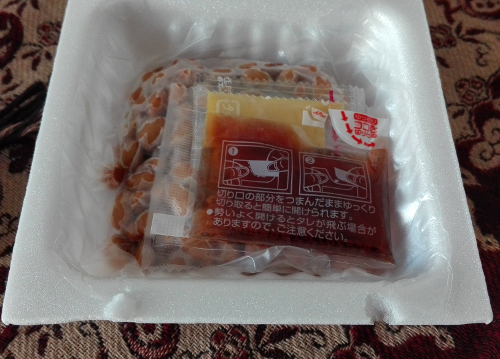 Specifically I’m talking about Natto (japanese) and Kimchi (korean). It’s fermented soy beans. It’s rich in proteins, magnesium, potassium, calcium, iron, vitamins B2, B6, E, K2, and apparently it’s very good against high colesterol, and it’s also good for your bones. Plus it’s low in sodium and fats, and it’s gluten free. The appearance it’s quite disgusting, a sort of glue with bits in it. According to wikipedia, it’s usually hated by westerners, and japanese people are split into lovers and despisers. Basically, it’s either black or white. It’s sold in little styrofoam containers, along with small bags of seasonings (mine had karashi, japanese mustard, and soy sauce), you add the two condiments into the beans, stir vigorously to form the goo, and you eat it, traditionally for breakfast, on a bowl of steamed rice (maybe with some fresh chives and sesame as toppings) or in other recipes (such as soups etcetera). I had it for breakfast on rice (but without chives nor sesame, and yes, in the picture, I had forgotten to add the mustard and the soysauce before stirring, but fret not, I did that later with rice). Starting from the smell, that everyone describes as terribly strong. Now, I really don’t think I had the “odourless” version, but the smell wasn’t that bad. I mean, taleggio cheese is far worse! The smell is malt-y, fermented… like an old glass of beer. Yes, I know, not really a poetic description, and it has very little to do with beer, but it was to say “like” something. Because there is nothing comparable to italian cooking. Anyway, it wasn’t that bad of a smell. Pair it with kukicha tea (roasted green tea), it’s perfect! Talking about consistency and texture, yes, it’s sticky, like when you have a runny yolk: sticky. But not unpleasant. It’s strange to chew, feels like you’re chewing something frothy. And as for taste, I can’t pinpoint the taste, it’s sort of smokey/slightly burnt (like the aftertaste of coffee? ), but the beans themselves have very little taste, luckily they had mustard and soy sauce. now, between “it’s disgusting” and “not bad” there is a lot of difference, the same lot as there is between “not bad” and “yummy!”. 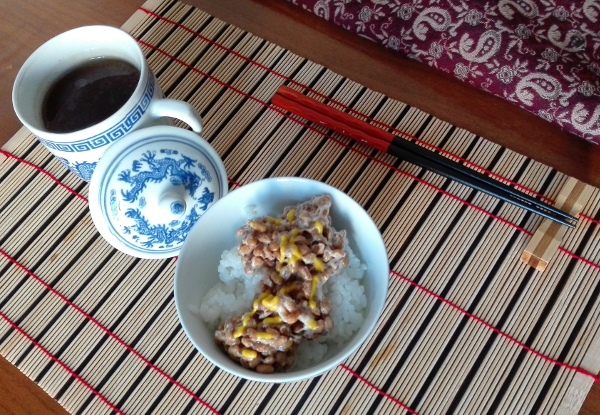 Basically, if I were in Japan and someone offered natto to me (or challenged me to the natto challenge), I’d have no problem eating it, more, I could actually enjoy it (most of all if paired with chives and roasted sesame :P). But for now I’ve tried it, I’m no longer curious, so I don’t think I’ll buy it again. Now on to Korea. Kimchi. 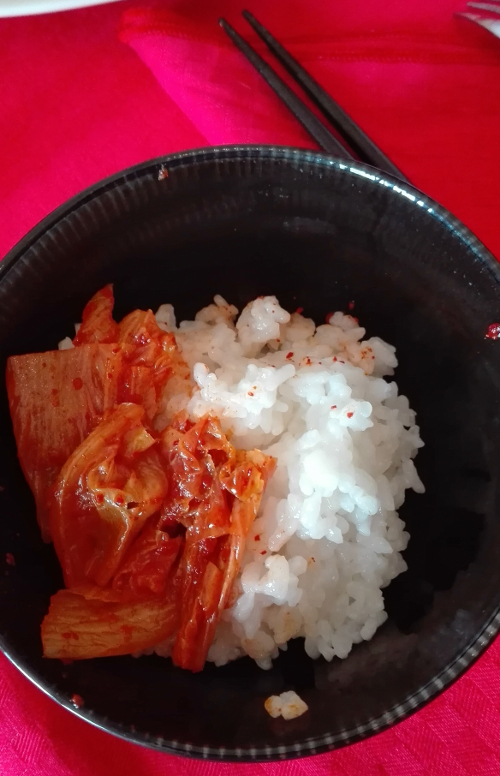 Kimchi is spicy fermented cabbage. There are tons of versions of it, with plenty of vegetables. And it’s rich in vitamins (B1, B2, C), carotene, calcium, iron and fibers. Plus it is very low in calories. Again I’ve seen it presented as something too strong and peculiar for westerners. My concearns were about the spiciness, since I’m not used to eat hot foods. But, in my personal opinion, we are too easily scared by the word “fermented”. Beer, wine, yogurt, cheese… these are all fermented! So come on!!! I’ve sauteed it quickly with a teenyweeny bit of butter, as adviced online, and served it on rice. The consistency is that of cooked vegetables: squishy, soggy, with crunchier or more watery parts. The taste is hot, spicy, and sweet-and-sour. This review is very short because I loved kimchi from the first bite, so I really think I’ll get more of it!